Discussion in 'Shelter' started by jordanzwon1, Feb 16, 2019. I have always used a Big Agnes Copper Spur UL2, but am looking for something a little more "Bush." What do you guys recommend for a tarp shelter or any shelter really? Sosteve, M.Hatfield, freebirdfb and 3 others like this. Check out the BCO 10 x10 tarp...or the KoreTemp modular shelter. Sosteve, M.Hatfield, freebirdfb and 8 others like this. Sosteve, M.Hatfield, Haggis and 2 others like this. The bushcraft outfitters 10×10 is really nice. I was pretty blown away by the quality for the price when mine arrived. With those dimensions you have endless options for setting it up from floorless tent to stargazing. I also have an orc industries tarp for about 70 bucks thats built like a brick shithouse and is fire resistant but its only something like 5 1/2' by 7 1/2' or so and fairly heavy, tricky to get you and your gear under and probably can't block the wind from more than 2 sides, but you can get a fire closer to it. depends what your style is i suppose. Sosteve, M.Hatfield, Blackhillz and 4 others like this. I try to go as light weight and multi purpose as possible, I prefer my USGI poncho, not a perfect shelter, but it works in a pinch. beestokk, Sosteve, M.Hatfield and 4 others like this. I carry an old issue S-59 Aussie Hootchie and a strip of tyvek. Ain't fancy or the latest and greatest, but it works and weights little. Sosteve, M.Hatfield, Haggis and 3 others like this. One heck of a tarp - very well made. I have the 10x10 and love it. You might want to check out this also - I believe this is going to be my next purchase. Sosteve, Haggis, Lonewalker and 2 others like this. I like a tarp when there aren't bugs. Favorite is a BCUSA 10x10 plowpoint. Big enough for just about anything I want to do in any weather, to include snow. Plus, you can flip it 180* in just a few minutes if you can set the ridgeline up right beforehand. (nature does not always allow that however.) Proper initial orientation prevents most wind/rain problems to begin with. I usually carry a BCUSA poncho (about 4'8" x 7') that's a decent enough fair weather lean-to, and have a pair of velcro-on wings I made for it when it's a little less fair. I carry the poncho alone on day hikes and hunting, and with or without the wings on backpacking trips. I could ride out a storm with or without wings if i had to. When canoe camping, i like a Whelen lean-to as a base camp. If moving every day, I tend to favor a hammock and tarp setup just because it's so easy to find a place without fussing. Sosteve, M.Hatfield, jayclimber and 6 others like this. Sosteve, M.Hatfield, Haggis and 1 other person like this. What’s the difference between their tarps. I was on their site looking at the coyote. Sosteve, M.Hatfield and Haggis like this. The standard ones are just differences in color and size. They also have syl-nylon which is lighter but as seeker said doesnt hold up to spark and flame. According to bco the multicam tarp is milspec material and rated as fire retardant where as the standard and sylnylon are not "Unlike other standard backpacking tarps, this material is also fire retardant" but it clocks in over two pounds. The standard 10x10 weighs 1 and a half, sylnylon weighs one and a quarter. The ponchos are smaller and thus lighter, and have the option to wear them to keep dry while hiking as well, but wont make the roomiest of shelters depending on what you're used to. Not that they won't be sufficient, just not too much extra space after you and your gear depending on how you set it up. I use a 10x10 in the chillier seasons when i can't sleep close to the fire or in terrain where the wind is unpredictable to block from all sides, or i'm out with wifey. Tons of options there. when i'm sleeping alone and close to the fire i use the military one. sometimes i just sleep in my bivvy if its not calling for rain. It's all up to what you feel is best for you, and what your sleeping on top of. if you use a closed cell pad or a raised bed and a blanket the tarp is really all you need, if you have a sleeping bag or air matress you'll want a ground pad. making one from tyvek is cheap and light i hear, i personally use a military bivvy for those occasions. You just have to find what suits you. Sosteve, M.Hatfield, jayclimber and 3 others like this. For a tarp shelter, my preference is a BushCraft Outfitters 10x10. Not to "drink the koolaid," but it really is a very well made item with enough tie outs to be durable, useful, and versatile while packing down into a small pouch (about Nalgene sized) that doesn't weigh much. If weight is of paramount concern, you might look into either a smaller tarp (less versatile) or a cuben fiber material (expensive and more fragile). If you plan to be in a hammock almost exclusively, then some of the asymetrical tarps designed specifically for hammocks do a wonderful job of giving you an awning so to speak while you hang with little to no excess bulk/weight. However, these too are less versatile. As for cordage, I made a pile of guy lines from ZingIt for my 10x10. This cordage is a bit more expensive than some other options but it's advantages are it has some of the strongest break strength for a given volume of any cordage made (thinner AND stronger than paracord), its UV resistant, it doesn't stretch in the rain (like paracord or nylon or bankline), and it's so light weight that it actually floats on water. I leave mine permanently attached to the loops on my tarp and just roll them up inside. Even with the cords attached to all the loops, I can still fit my 10x10 inside the original stuff sac with ease and room to spare. Sosteve, M.Hatfield, jayclimber and 5 others like this. Kifau supertarp is the lightest (17.6 oz) , easiest quick set up option I've found (that works for me) which only need 2 poles which is found in the bush also pegs. I use MSR groundhogs but obviously that could be made also. Of course they are $300 new but... if you're willing, they are golden IMO. I found mine on eBay at a much reduced price w/the annex for stove, but that is optional. Sosteve, Not Sure, M.Hatfield and 1 other person like this. The BCO tarps are nice, for tarps. I've spent a lot of nights in a Copper Spur UL1 though. It's hard to beat a good tent, especially when bugs are a major concern. I also appreciate the stability and ease of setup of a free-standing tent. You can pitch tarps and non-freestanding shelters anywhere, but it's easier with a good tent. If I had to choose only ONE shelter for any scenario (at least anything average people will encounter in North America) then I’d choose a reasonably lightweight and packable freestanding tent. With that out of the way I’d add everyone should own a BCO 10x10 or a DD 3x3 meter tarp, because they are sweet and versatile. I’ll say my general preference is a tarp and hammock set up. Another awesome shelter I just discovered was the tipi, never tried one but I picked up a fully enclosed one and it’s pretty roomy and packs down small. Sosteve, M.Hatfield, goon and 2 others like this. The main recommendation you're going to get is a 10x10 tarp. I use a DD 3m x 3m tarp, and I found it to be bombproof. I have used the same one for a few years now, in all seasons here in PA, and it's the only shelter I ever use anymore. If you're trying to save weight and space, go with something that is silicon-impregnated nylon. M.Hatfield, La\\//inci and Haggis like this. M.Hatfield, jayclimber and Haggis like this. I want to try a alp kit hunka bivvy bag, paired with my poncho possibly. I swear by my bco fire retardant tarp. Extremely versatile. I just add a ground tarp and have a fire a few feet away and don’t worry at all about Embers. Bushcraft and Brews and M.Hatfield like this. M.Hatfield and Odinborn like this. So many options listed here will work great. Something which is 10x10 feet of 3x3 meters will likely work best for the MOST applications. Depending on your needs and time of year, I suggest a bug net of some description. @jordanzwon1 what does "packable" mean to you? There are many directions you can go, depends on your intended uses and tolerances. Aqua Quest tarps are awesome...but the Defender is heavy. Aqua Quest makes 3 grades of tarps...I forget...I think it is "guide", "safari", and "Defender". The Defender is the heaviest...more of a vehicle tarp, I think. For "packable", I would get one of the lighter versions. If you are thinking tent...I'm definitely no expert on tents....but I recently bought one for myself and the wife (she wants a tent, no hammock and tarp...bugs or whatever), and after doing a TON of research I decided that by far the best bang for the buck, for a 4 season tent, that wasn't too heavy, and was what I call a "normal" color...meaning something earthy or woodsy...I settled on the Snugpak Scorpion. I haven't used it yet. Just throwing that out there as an option. One of the things that was important to me was whether it looks "woodsy", for lack of a better term. It does. Beautiful dark green...doesn't disrupt the beauty of the forest at all. Fits right in. Blackhillz and M.Hatfield like this. RAB Sil nylon tarps and RAB Element shelter and big screen. I would suggest looking at the RAB Element 1 or Element 2 shelters. They are kind of a tarp type tent shelter set up with trekking poles and they offer an optional tub and bug mesh option. M.Hatfield and Midwest.Bushlore like this. I bought the Etowah 10x10 and love it! I'd throw in the Snugpak Ionosphere. Bivy-tent, lightweight, low-profile, simple, and pretty rugged. Can be found on the cheap as well. Bit more than a tarp or bivy, but not quite a free-standing tent. 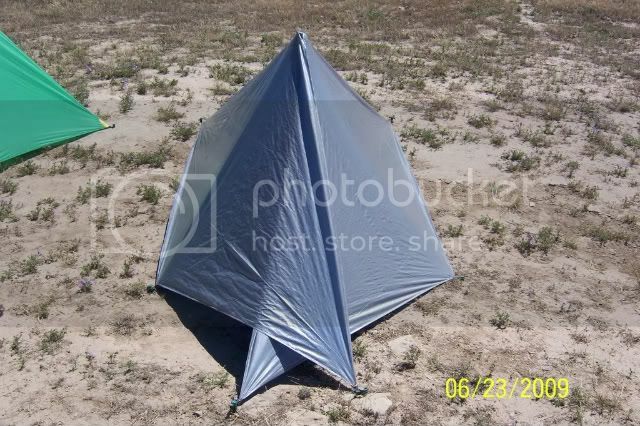 I have an early 'Tarp Tent' (similar this one pictured) from Wyoming Lost and Found. Basically a tarp that was cut and sewn to be much like a plow set up tarp - but with a set of flaps to keep the rain out. Alaska can get very wet - as opposed to just wet all the time. It's nice to be able to set up a shelter that will keep the rain out. It is cramped, has no ventilation, and condensation can be a real issues - it is not a 3 season tent. What it is - it is easy to pitch, strike, and folds very flat for carriage. Weighs right at one pound. Allows me to keep my poncho for use as, well....a poncho.